Sharing and republishing online content is a common activity for all of us. If it’s your own content, then you can tweet and post on Instagram or Facebook without worrying about copyright law. If it’s someone else’s content, though, then you may need to obtain copyright permission before sharing or republishing it on a website, blog or social media site like Twitter or LinkedIn. 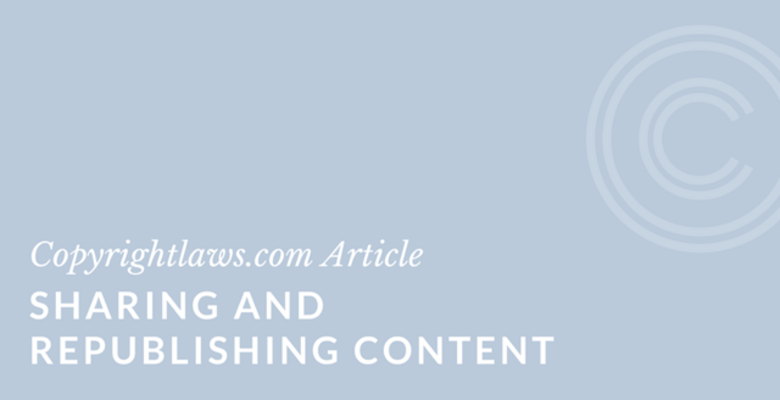 Below are six essential facts about copyright law, plus six tips for staying copyright compliant when sharing and republishing articles, images and presentations and other content. Want more information? See the Copyright Leadership Certificate program. Copyright applies to work in traditional print media and on digital platforms like your enterprise’s intranet, website or social media. Most forms of creative expression are subject to copyright protection once they’re in a fixed form (see below). There are whole books and courses written on various aspects of copyright, but these six essential facts are a good starting point for developing your copyright mindset when using online content. Copyright applies to a work as soon as it’s created and “fixed” (i.e., written on paper or saved to a hard drive, disk or memory card). Use of a copyright symbol, ©, or registration with the U.S. Copyright Office isn’t required for copyright protection to exist. The duration of copyright in the U.S. is the author’s life plus 70 years, often referred to as life-plus-seventy. There are lots of exceptions to this general rule, so do your research when determining duration of copyright protection in a work. A work is in the public domain after the copyright duration period expires. Sometimes it’s because it wasn’t subject to copyright protection in the first place (e.g., many U.S. government works). Copyright first belongs to the author of the work, in most cases. However, sometimes the author assigns their rights to someone else. Or, in some employment and commission situations, copyright belongs to the employer. Copyright also involves moral rights, which provide authors the right to have their name on a work, to use a pseudonym or be anonymous, and the right to prevent modifications to a work that might be prejudicial to their reputation. In the U.S., moral rights apply only to authors of works of visual art, who can choose to waive them. Under U.S. copyright law, you can apply the concept of fair use to your use of copyright-protected materials without obtaining permission. A fair use determination involves various levels of analysis including a risk management assessment, and only a court of law can determine if you applied fair use correctly. Always assume that any image or text or other work you find online or elsewhere is copyright protected and you need permission to use it. Then check to see if the work is in the public domain and freely available. Don’t use copyright-protected works unless you have permission from the copyright holder (or fair use or an exception in the Copyright Act applies to your particular use). Being unable to locate a copyright owner or not receiving a response to your request doesn’t allow you to use copyright material in the U.S. Consider alternatives as discussed below. Learn how to obtain permission to use online content. Linking — You can link to a legitimate source of the work, such as on the creator’s or copyright owner’s website. Avoid other sites where the link might have been used without permission. Also, it’s safer to avoid embedded links. Using just the facts and data — You can state facts, history, news or events as long as you don’t reproduce the exact source where you found them. Limiting usage — Generally, use of small portions of a work may be acceptable, such as a short quotation or a thumbnail print of an image. Describing and summarizing — Describe the image or provide a brief summary of an article. Creating your own — Can you present the data in a chart that you create yourself? Can you take your own photograph? Bear in mind that your employer could own copyright in any works you create in the course of employment. Using a stock photo agency or a Creative Commons license — Does your organization have an account with a stock photo agency that has an image that suits your purpose? Can you find a suitable work that’s covered by a Creative Commons license? In either case, read the terms and conditions of the license, and honor any restrictions that apply. Neither of these licenses means automatic permission or permission in all circumstances. Determining if fair use applies — If you’re using the work only in the U.S., you could apply the fair use provision of the Copyright Act, if your enterprise supports this. Consult your internal policy, copyright specialist or legal counsel before proceeding. If you obtained permission to use an image in the past, what was the use and for how long? Making different use of a work, using it in different locations or for different lengths of time could require separate permission. Permission to use a photo in your presentation or brochure doesn’t automatically allow you to re-color, crop or otherwise manipulate and morph it. Seek permission first. You might also find our article 6 Essential Tips for Legally Using Images helpful as well as our primer article Legally Using Images. The information presented above applies to use of copyright-protected works in the U.S., but copyright law varies among countries. There are differences in copyright durations, moral rights and ownership of works created in employment, just as a few examples. The copyright law of the country where a work is used applies to that use. Therefore, if employees in the U.S., Canada and France will use the material on your intranet, you must ensure you’re abiding by the laws of each of those countries. Yes, there’s a lot to think about when it comes to copyright, so it’s important to familiarize yourself with the copyright basics. It’s also good to know when and where to turn for guidance when issues come up.